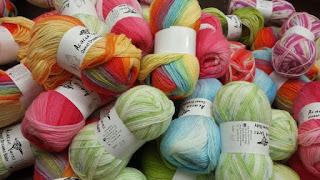 Yarn and Fiber Happenings: People's Choice is Rowan Yarns 10% - 50% off MSRP at the Yarn and Fiber Fall Sale Spooktacular! People's Choice is Rowan Yarns 10% - 50% off MSRP at the Yarn and Fiber Fall Sale Spooktacular! Rebecca Nurse, the last of our accused witches, had two sisters, one of whom was Sarah Cloyce who was outraged at the treatment and accusations towards her sister. After Rebecca's imprisonment, Sarah stopped attending the church run by Reverend Parris. Neighbor's of Sarah though eventually persuaded her to attend the Sunday service. All was quiet in the church; the bewitched girls sitting happily now that all the witches were imprisoned. Sarah Cloyce entered the church and as soon as Parris began the Sunday sermon - which focused on who and how many devils were actually in the church - Sarah stood up and left the church, slamming the door behind her. She was now the talk of the community and the girls again began to fall into fits and were seeing visions of a group of witches removed from the community gathering nearby to receive the unholy sacrament of red bread and bloody wine. One of the girls cried "Oh Sarah Cloyce, I did not expect to see you here!" An arrest warrant was issued immediately for Sarah. (I think these girls just needed more challenging knitting! Plus it seems to suppress fits and convulsions - not bad). Of course, Mary Walcott did confirm Abigails sighting of two witches sitting near the magistrates - namely John Procter sitting with a dog under the table. Yes, this sale extends through to Tuesday due to the Monday holiday! Happy Columbus Day to the US and Happy Thanksgiving to Canada! 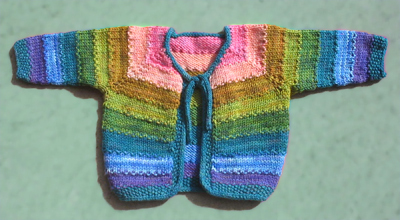 This cardigan uses 8 different colorways in Dream In Color Classy yarn.